The Holiday Season is upon us and it is time to to celebrate! What is better than festivities and running?! it’s the perfect time to get in a little exercise with all those extra cookies, cakes, pies, and candy that we all be eating. The great thing about running in December is all the Holiday-themed races! I have picked out 15 races to run in Virginia and Washington, D.C. that look like a blast! Hopefully you will find a festively-themed run near you. I would love to see pictures, so share them with me on Facebook! Join in the festivity and fun during the annual Monticello Holiday Classic 5K and Deck the Halls Kids Dash! This family-oriented 5K begins at the East Walk of Monticello and ends at the David M. Rubenstein Visitor Center and Smith Education Center. Kids 12 and under can enjoy the Deck the Halls Kids Dash, a loop around the West Lawn within the shadows of Monticello. Children under 18 must be accompanied by an adult. The Reindeer Trot 7k Challenge, Reindeer Rally 5k, & Little Reindeer 1-Miler take place on December 2, and Mount Trashmore City Park in Virginia Beach, VA. The 5k and 1-mile courses are stroller-friendly, while the 7k is not. There will be event t-shirts, custom medals, outfit awards, and much more! Free Public Parking is available at the event location. 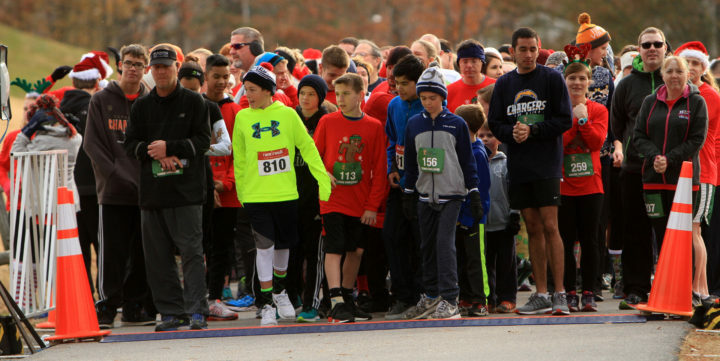 The Christmas Classic 5k takes place in Bedford, VA on December 2. This 5k run/walk includes a corporate cup team, The Peaks Junior One-Miler (Timed and includes T-shirt), and 1/4-mile Kids Fun Run (not timed). This race has been dedicated to the previous race director Sabrina Bugay-Willis, wife and mother to Kevin Willis and Hanna. We will be taking a moment on that day to remember her as we start the race with the sound of a horn. The Run with Santa 5k takes place at Reston Town Center on December 3. Santa and Mrs. Claus will be running the race to raise money for charity. The more people that finish ahead of them, the more money that =PR= will donate to a local charity – Our Neighbor’s Child. Pre-registered participants will receive a Run with Santa 5k long sleeve moisture wicking shirt AND the first 1500 people to packet pickup will receive a festive Run with Santa Christmas ornament! Spread the joy of the holiday season by wearing your favorite holiday gear or costume for the race! Whether you dress up in a Santa suit or dress as an elf, you have the chance to win an award for best costume! Enjoy the sights, smells, and sounds of Christmas as you wind your way through the world’s most beautiful theme park in this exciting 8k run through the wonderfully decorated Christmas Town in Busch Gardens, Williamsburg, VA. The Christmas town Dash 8k takes place on Sunday, December 3, 2017! The Farmville Jingle Bell Run 5K begins at First Avenue field, and follows a mostly flat course with some hills through Farmville’s Historic Avenues. The run will finish back at First Avenue field at the start/finish line. Timing and scoring of the 5K run will be provided. 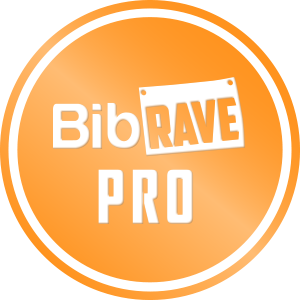 Medals will be presented to the top 3 overall male & female finishers and top finishers in each age category that participated in the 5K. Step into a tacky wonderland filled with lights, elves, the big man himself…and more! We’ve turned RVA’s favorite holiday tradition into a can’t miss experience for anyone and everyone! 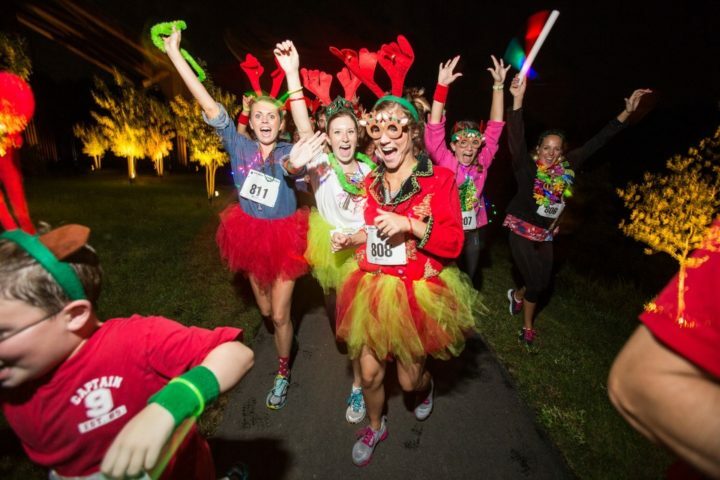 on December 9, travel to the North Pole and spend a night immersed in holiday cheer for the CarMax Tacky Light Run! This is a stroller-friendly event, and children in strollers do NOT have to register. Included with your fee is a Santa Tracker (bib), admission to the North Pole, plenty of photo opportunities, and participant presents (hat and ornament finisher medal). A Secret Santa Glow kit is available during the online registration process for an additional fee. The Arthritis Foundation’s original Jingle Bell Run is a fun way to get decked out and be festive, while racing to raise funds and awareness to cure America’s #1 cause of disability. 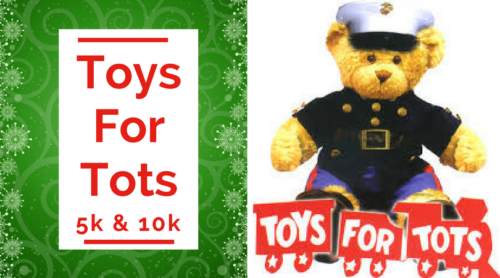 This race takes place on December 10 at City Center at Oyster Point, Newport News. Put on your favorite holiday costume and tie jingle bells to your shoelaces. ’Tis the season to live it up and be jolly for a reason! Bring a team of friends, family and co-workers to run or walk, spread smiles and good cheer … and be a Champion of Yes! 100 percent of your registration fee and fundraising efforts go to this great cause. 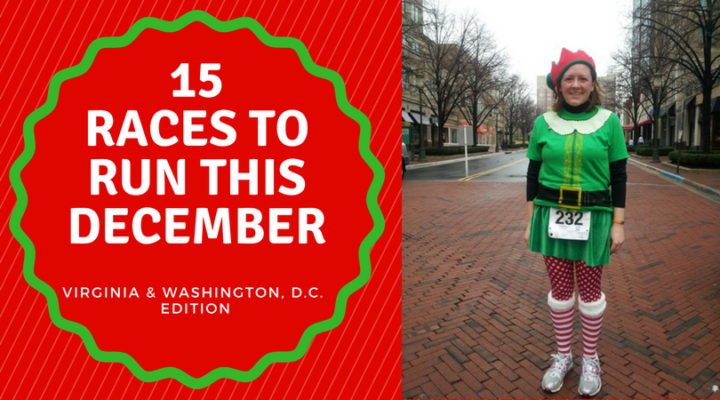 The Jingle All The Way 5k & 15k takes place in Washington, D.C. on Sunday, December, 10, 2017. 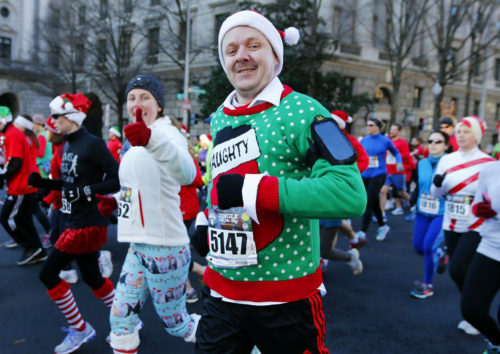 This is a highly festive race, with many runners dressing up in holiday-themed outfits! Check out my 5 Reasons to Run the Jingle All The Way 5k & 15k! 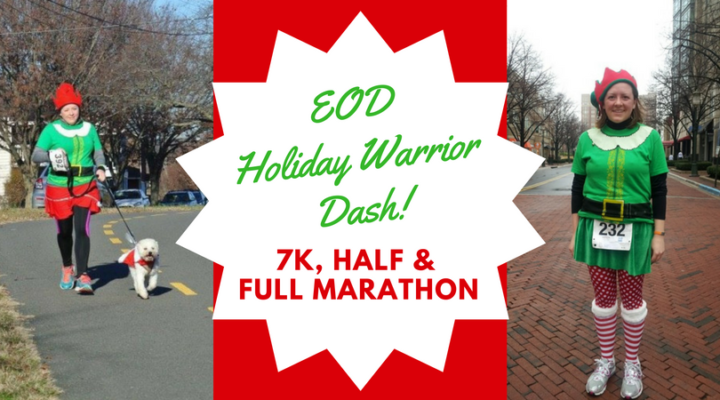 The EOD Warrior Holiday Dash takes place on Sunday, December 10, 2017 in near Georgetown, Washington, D.C. This Holiday themed race is in partnership with EOD Warrior Foundation, who serves the EOD community by providing financial assistance and support to active-duty and veteran wounded, injured or ill EOD warriors, families of our wounded and fallen EOD warriors and by maintaining the EOD Memorial. All three events run on the Chesapeake & Ohio Canal path. Walkers are welcome to attend this event. Santa’s 5k Run/Walk for Kidney Awareness is perfect for people of all athletic backgrounds. With gorgeous Matthews State Forest as the scenic background, participants will be treated to a professionally organized event including timing, course photography and posted race results. The best part? All proceeds go to the American Kidney Fund to help patients in need. The Surf-n-Santa 5 Miler takes place on December 16, 2017 in Virginia Beach. 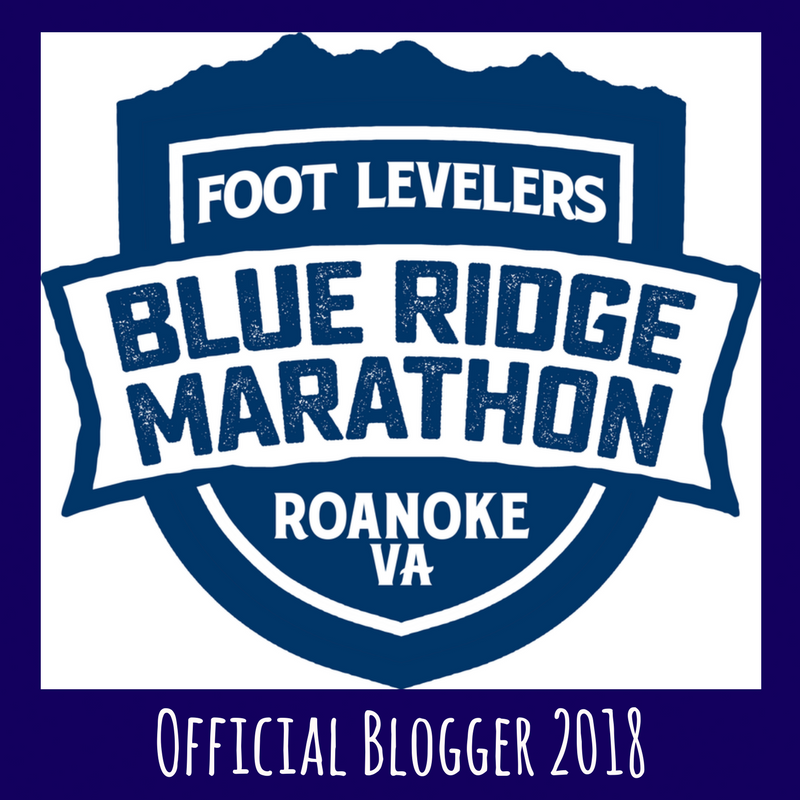 All of the participants will receive a 5-piece Santa Suit, a unique medal, a finisher’s item, free photos, and will run through a nautical holiday wonderland along the Atlantic ocean. The event is held at twilight along and runners will enjoy the Holiday Lights Merry Mile and a festive evening being mesmerized by the holiday spirit. Jingle Bell (7th Annual) 5K Run and Walk! 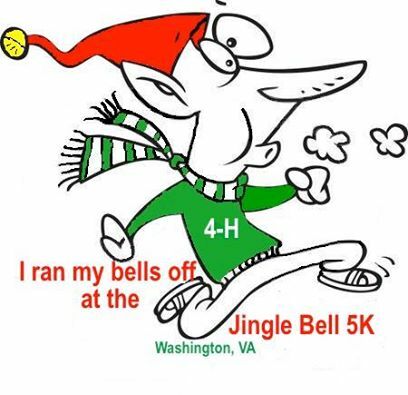 The Jingle Bell 5k Run and Walk takes place on December 16. Enjoy the holiday season with our run/walk through the beautiful & historic town of “Little” Washington, VA. The venue, the Town, and the holiday fun all come together to make this run one of the years best! JINGLE BELLS will be provided! I’m linking up with Patty, Erika, and Marcia for Tuesdays on the Run, Rachel, Lora, and Debbie for the Coaches’ Corner, and Annmarie and Nicole for Wild Workout Wednesday! These all look great! 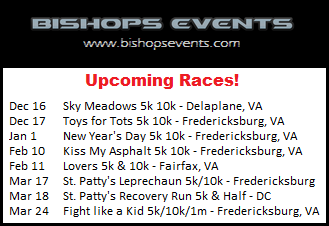 I love in Philly but have family in the DC area – I should get my brother to sign up for one of these races! We don’t have nearly this many holiday races where I live. They all look like so much fun! I’m running the Jingle Bell 15K for the first time this year. I keep forgetting that I registered for it last December LOL.